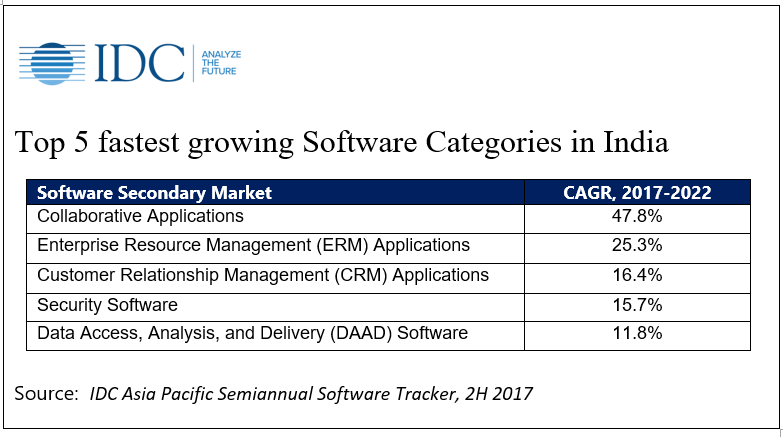 The India Software Market is expected to achieve a year-on-year (y-o-y) growth of 13.5% by the end of year 2018 to reach USD 5.6 billion, as per ( International Data Corporation) IDC's latest Asia Pacific, excluding Japan (APeJ) Semiannual Software Tracker, 2H 2017. "Digital Transformation initiatives in Indian enterprises are fueling the growth story across a number of industry verticals and customer segments. One of the major areas that have received thrust because of these initiatives is modernization of core applications – this has boosted the India Software market and is expected to continue driving the market for the next 3-5 years," said Ranganath Sadasiva , Director Enterprise Solution, IDC India . For the forecast period, 2017-2022, IDC predicts the following five fastest growing Software categories: Collaborative Applications, Enterprise Resource Management (ERM) Applications, Customer Relationship Management (CRM) Applications, Security Software, and Data Access, Analysis, and Delivery Software ( please refer table below ).